Let’s Talk About Shrinkage – it's only a bruise. Relax! Get your minds out of the gutter! I mean shrinkage of your other brain. I went to a very informative seminar today, led by my doctor, Dr. Bhupendra Khatri. He’s one of the very best specialists in the Midwest (if not in the entire country) and is very involved in research and the treatment of Multiple Sclerosis. He’s a little bit of a medical celebrity, so I figured–hey!–why not check out a free seminar on stuff I had questions about and save a separate onslaught of questions for an office visit? The topic of this talk was MRIs, something that MS patients know very well. We get them every 6-12 months for the first five years following diagnosis, every other year until year ten, and then every three to four years after that. As you can imagine, this gets very, very expensive (each scan is several thousand dollars and we can count on getting more than one scan each time we go in) and although routine and familiar, it’s a burden–mentally, emotionally, physically, financially. But what does it all mean and what role does each scan play in our prognosis? My doctor did a wonderful and thorough job explaining what he looks for in scans, putting everything into layman’s terms, and patiently fielding questions along the way. We saw slides of brains with active lesions, old lesions, and brains with permanent damage. I’ve seen all of this before, some on my own MRIs, so these slides didn’t shake me too much. But a little later, Dr. Khatri got to a point in his presentation when he brought up a slide of an MRI patient and pointed out atrophy of the brain, likening it to shriveled cauliflower. You know, this information wasn’t new to me, but for whatever reason today when I saw my doctor point to a picture of a real person’s brain and show us how it was shrinking…I don’t know. It just pumped me full of fear and sadness. I know that wasn’t the intention, by any means, but I had a weak moment and I let it take over. It’s okay. It happens to a lot of people. No matter the stage or severity of our disease, many of us living with MS are mourning. We struggle with a feeling of loss–the loss of our former lives, our former abilities, our former selves. 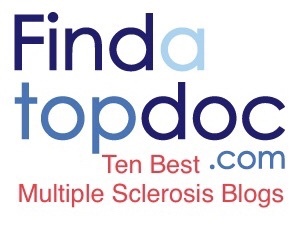 Getting a diagnosis of MS, particularly at a younger age, changes you. No matter how positive your outlook, you will never look at yourself in the same way. And how can you? Your body is attacking itself, recognizing YOU as an enemy, an impostor. Multiple Sclerosis can (and does) take away our vision. Our energy. Our balance. Our control over our bladders. Our libido. Our mobility. Our short-term memory. Our focus. Our clarity. Our speech. Our sensations. Our careers. Our relationships. But our physical brains, too??? Without full use of your legs, you’re still you. If you go blind, you’re still you. But without your mind…who are you? What are you? What do you become? This is your brain on MS. The thing I love most about my doctor is his bedside manner. Despite his very busy schedule, he takes the time to answer questions and and is truly personally invested in each of his patients. He ended his talk on an encouraging note, discussing treatment options, studies, and the resulting efficacy and outcomes. I left feeling uplifted, but that image of the shrinking brain is tattooed on my own today. What do you do to keep you mind strong and sharp? If you have MS or you love someone who does, I highly recommend Dr. Khatri’s latest book, Healing The Soul. Also, hey! I’m on Facebook, Twitter, and Instagram. Follow me for updates and musings between blog postings! Kylie Jenner: Avant Garde or Offensive?